At Reynolds Contracting, we offer a wide variety of services specific to hardscaping and landscaping. Unfamiliar with hardscaping? Think of landscaping as the living elements of your property (i.e. trees, shrubs, flowers), and hardscaping as the nonliving features that enhance aesthetics or improve the function of your property. Hardscaping with decorative concrete is one example of the endless possibilities available today in this industry. 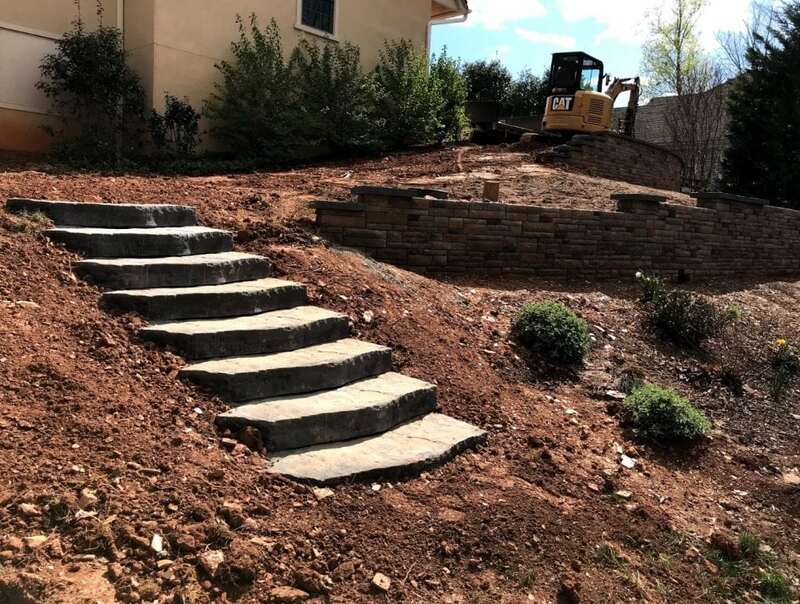 In this case, the hardscaping on a local Keswick home not only adds to the aesthetics of this property, but it also adds a functional staircase. 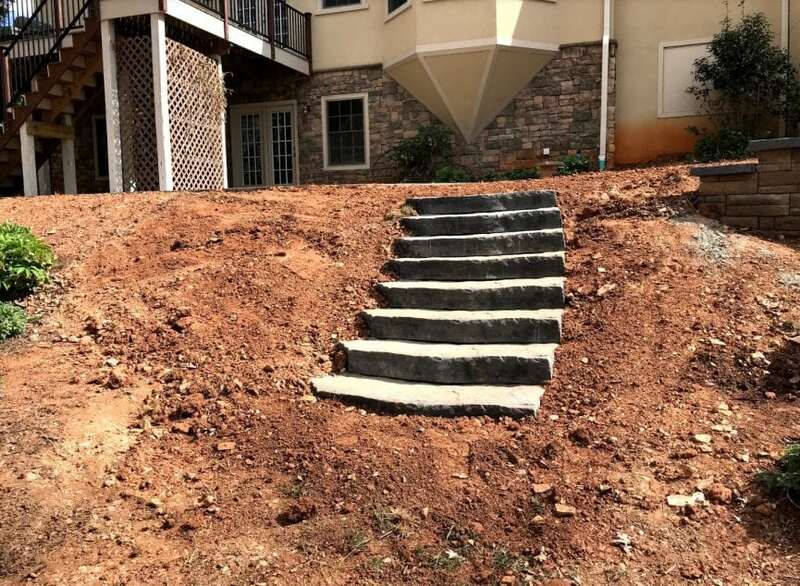 The homeowners will now be able to access a lower portion of their lawn by way of these steps. We were able to create the look of natural stone, but it may come as a surprise that we did not have to dig for heavy rock or be too picky about the stones that were available. So how did we do it? These steps are actually concrete artificially made to look like stone! We have fun with all the new things you can do with concrete. No longer are we limited to the plain, smoothed concrete of industrial sidewalks and boring walkways. Concrete can do so much more – from stamped concrete paths to building entire homes! We thought these steps turned out as a great example of how beautiful and versatile concrete can be. Ready to start dreaming of what concrete can do for you? Look around your current landscaping and hardscaping. Maybe you already have a path that needs some updating. We can add stamped or stained concrete to add peace and tranquility to your gardens. Or perhaps you have been thinking about enlarging your back patio to create a bigger entertaining space. Hardscaping with decorative concrete could add charm and value to your home. Whatever your dream, we’d be happy to help it come true! Give us a call at 434-293-6724 for an estimate!